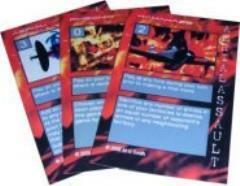 The major change brought with the Aerial Assault command deck is the introduction of the new Aerial Commander. Unlike previous expansion decks, the Aerial Assault deck comes with two neutral colored commanders in order to slot directly into game play as and when required. Each of these new commanders, once brought into play, allows the player who owns them to fly a Sortie at the beginning of each of their turns prior to making a standard attack.